In 2005 my partner Christiane and I found ourselves, almost by accident, in Mongolia. We were midway through The Big Trip East, which was supposed to be all about China, Russia and the Trans-Siberian Railway. But as the years went by and other memories faded, it was the 16 unscheduled days in Mongolia that stayed in my mind. In 2010, having contemplated the idea for years, I decided to commit the memories to paper. The result, entitled "Hold the Dog! 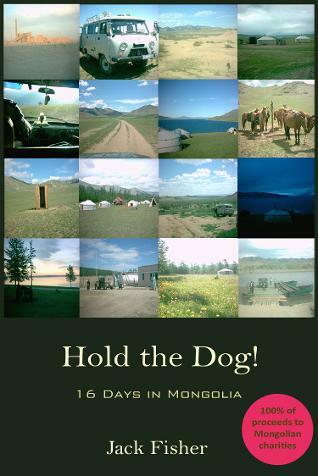 : 16 Days in Mongolia", is available from Amazon in paperback and ebook form. 100% of the profits will be split between two Mongolian charities: CAMDA and the Yamaa Trust. Mongolia is a fascinating place to visit, and I heartily recommend it to anyone. If you're thinking of going, have already been, or are just the slightest bit curious, then you may find my book enjoyable. And even if you don't, the charities will still benefit, so your money's not entirely wasted. Other highlights from The Big Trip East were Tiger Leaping Gorge in south-west China, Lake Baikal in Siberia, and the Trans-Mongolian railway, each of which inspired me to write short travel articles. The Tiger Leaping Gorge article was published in the September 2006 issue of The Traveler e-zine, and in issue 15 of Itchy Feet Magazine. The Lake Baikal and Trans-Mongolian articles are currently unpublished. All three articles can be downloaded in pdf from the links below.